Getting to Vancouver Island Is Easy! Travel to Victoria BC can be done by air, by sea, and even by driving... Learn how to travel to Victoria and Vancouver Island with a minimum of hassle. How much luggage do you take on vacation? How much of what you take do you use or wear? Our first trip to Paris looked like a Marxx Brothers comedy. People were staring and pointing at us as we went through the airport. Now, we have a better idea of what we should really bring. Victoria can be reached easily by the Victoria International Airport, which has non-stop flights to and from Toronto, Honolulu (winter), Salt Lake City, Seattle and many cities throughout Western Canada. The Abbotsford International Airport also serves the area. Multiple scheduled helicopter and seaplane flights are also available daily between Victoria harbour and Vancouver International Airport or Vancouver harbour (35 minute flights). Victoria International Airport is served by BC Transit, with the number 70 bus making some stops. There is also a direct bus service run by a local business, as well as taxi service. By car, the airport is a 20 minute drive from downtown Victoria via Highway 17 northbound. Tens of thousands of people travel to Victoria BC by sea.I personally think this is the best way to arrive because the trip itself is quite an adventure and the views of the sea and the islands are spectacular no matter what time of year you come. The Washington State Ferry terminal in Sidney, British Columbia provides ferry service to Friday Harbour, Orcas Island, and ultimately Anacortes, Washington. 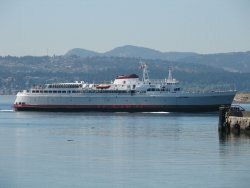 In Victoria's Inner Harbour, an international ferry terminal provides car ferry service to Port Angeles, Washington state, high-speed catamaran service to downtown Seattle, and seasonal passenger ferries to destinations in Washington State including Friday Harbor, Port Angeles, and Bellingham. Victoria also serves as the western terminus (Mile Zero) for Canada's Trans-Canada Highway, the longest national highway in the world. To check highway road conditions, you can call 1 (900) 565-4997. Seatbelts must be worn by drivers and passengers in BC. Children under five must use an approved safety seat. Motorcyclists and cyclists must wear helmets. Drive on the right-hand side of the road and, if it's safe to do so, feel free to turn right at a red light after making a full stop, unless signs indicate otherwise. If you are involved in an accident, immediately contact the local police or RCMP, and then contact your insurance company. It is a criminal offense to operate or be in the care or control of a vehicle, whether in motion or not, with a blood alcohol content of more than 0.08 percent. Speed limits are posted in kilometres per hour. Out of province drivers' licenses and international drivers' licenses are valid in BC for a maximum of six months. Drivers with a non-English language license are advised to obtain an international license. Visit the British Columbia Automobile Association for more information. You may or may not need to carry additional car insurance. Check with your current insurance company to determine their policy regarding rental car accident claims. If you're flying into and staying in Canada, it would be worthwhile to check out air/hotel/car rental packages with Orbitz, Travelocity, Expedia or Priceline. Many times they can offer a better rate when you book everything together. If you're not sure if you need a car, check with your hotel. Many times they'll offer free shuttle service from and to the airport. And getting around Victoria is very easy. Whether coming by air, by sea, or by land, travel to Victoria BC is grand fun!